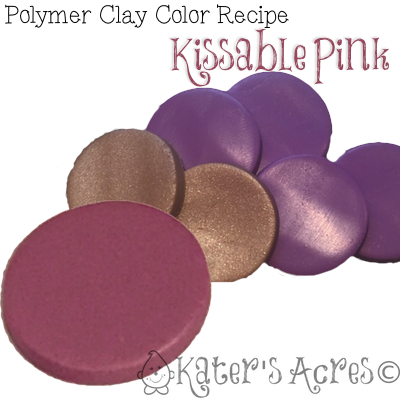 This polymer clay color recipe is one of 5 colors for the 2016 Valentine’s Day Color Palette, Kissable Colors. Make all 5 of these luscious colors to enjoy this Valentine’s Day. Enjoy! PLEASE NOTE: This is what I call a morphing color. Why? Because you could also classify this is more of a mauve as opposed to a pink color. It depends on what color you are combining with it. Next to true pink it is more purple. Next to purple, it is pink. It varies across different lighting as well. Add 1 additional part Premo! copper for a warmer tone that is more pink & has more shimmer. Add 1/2 part Premo! Pearl for an instant lightness and brilliance. Add 1/4 part Premo! Black for a deeper pink. Add 1/4 part Premo! White for a lighter & brighter pink. What kinds of things would you make with today’s polymer clay color recipe? Feel free to post your creations on my Facebook page and show everyone what you have made with the color palette from today’s blog post. Also, feel free to tweet your picture to @katersacres with #KatersCP to show off your creation! I hope today’s color selections help you get back into your studio this weekend! Thanks for joining me today and don’t forget to sign up for more tutorials, prompts, and projects direct to your email.